The Integra heat recovery unit has been specially designed to provide ventilation for flats or internal rooms in residential, commercial, educational or leisure applications. Balanced ventilation is achieved by using nominal 100mm diameter ducting. The unit is completely self contained and includes two integral centrifugal speed controllable fans plus a high efficiency polymeric heat exchanger. Using a high performance, polymeric heat exchange cube, together with two powerful fans, the Vent-Axia Integra boasts a temperature efficiency of up to 70%. The compact cube interleaves outgoing moist air with incoming fresh air, allowing the heat from one to warm the other without the two air streams mixing. Energy is saved on room heating, with no power being used by the cube itself. Performance of Integra: Up to 49 l/s FID. Ideal for installation in the ceilings voids or cupboards. The Vent-Axia Integra is designed for mounting in ceiling voids, lofts or above a suspended ceiling. Four 100mm spigots are provided for simple connection to insulated flexible or rigid ventilation ducting. The unit comes complete with a 22mm condensate outlet. The Integra heat recovery unit has been specially designed to provide ventilation for flats or internal rooms in residential, commercial, educational or leisure applications. 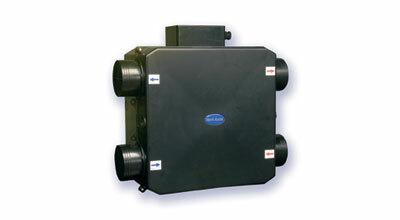 Balanced ventilation is achieved by using nominal 100mm diameter insulated flexible ducting. The unit is completely self contained and includes two integral centrifugal speed controllable fans plus a high efficiency polymeric heat exchanger. Using a high performance, polymeric heat exchange cube, together with two powerful fans, the Vent-Axia Integra boasts a temperature efficiency of up to 70%. The compact cube interleaves outgoing moist air with incoming fresh air, allowing the heat from one to warm the other without the two air streams mixing. Energy is saved on room heating, with no power being used by the cube itself. Performance of Integra: Up to 175.4m³/h FID. Ideal for installation in the ceilings voids or cupboards.